Hiya guys! Man this week is flying by and I am loving it. Usually I find that time escapes me, but with so many polish collections releasing I feel anxious for the dates to come. Heaven knows I need the little pick me up. But I know I'm not the only one so allow me to play the role of enabler once more, haha. 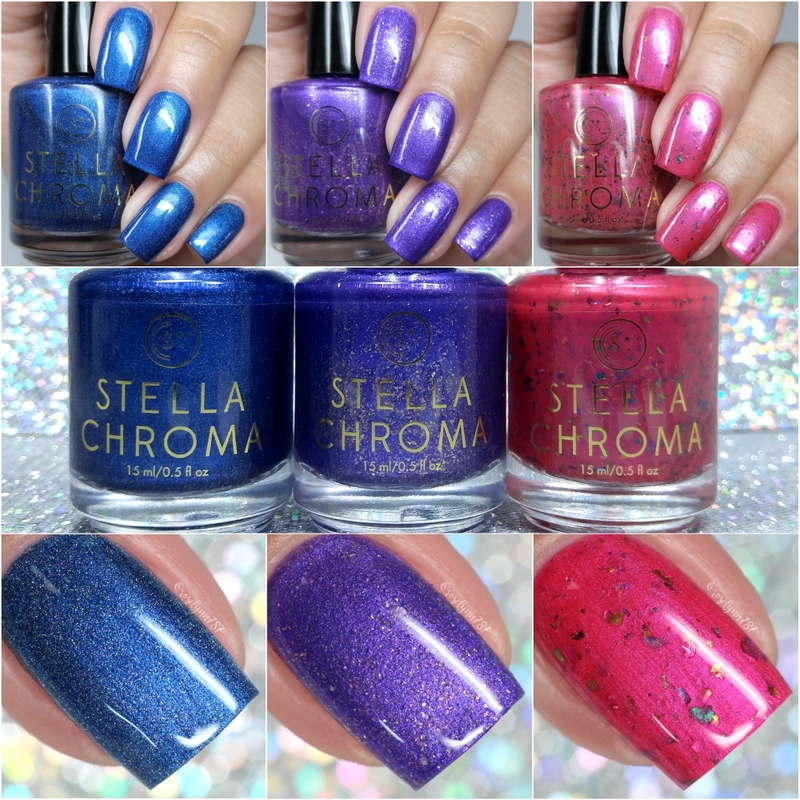 Today I'm sharing swatches for the stunning Premier Trio by Stella Chroma, former known as Paint Box Polish. But before we get to the swatches themselves, let's take a look at the brand itself. One of the major changes with this rebranding is charity! The creator behind Stella Chroma, Pam, is a Nurse Practitioner with nieces that have an avid interest in the sciences. Because of that, Stella Chroma will be partnering with a different organization each quarter and donating a portion of sales. The first one is IGNITE (Inspiring Girls Now In Technology Evolution), which is a non-profit that introduces girls in grades 6-12 to technology and engineering careers via various programs in partnership with their schools. 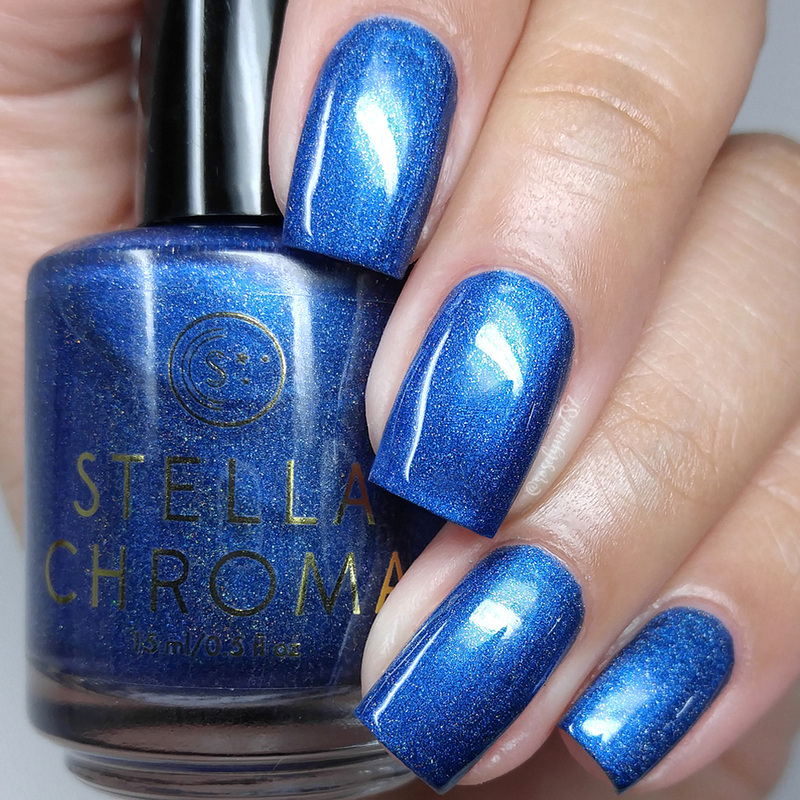 The Premier Trio by Stella Chroma will be releasing Thursday, June 29th. Each full-size 15mL bottle will be retailing for $12 to $13, depending on the finish. Check out the end of the post for a special customer giveaway! Grit can be described as a rich cobalt blue that is loaded with rainbow holographic glitter and also a slight blue shimmer. Gah this shade is totally giving me life! 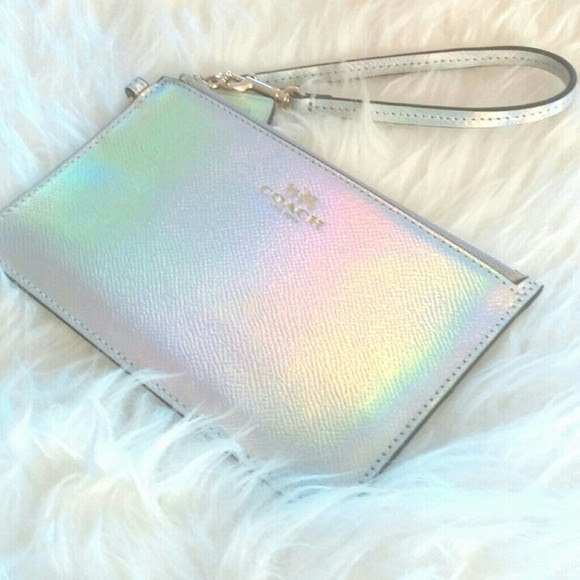 The holographic finish is incredible in direct sunlight. My photos really do not do it any justice whatsoever due to being taken indoors. Curse my literal mani cave, haha. The formula has a really smooth and opaque application, pretty much almost a one coat wonder. It has a great balanced consistency, not too thick or too thin. Despite it's pigmentation, I experienced no staining on removal to my cuticles or nail bed. Shown in two coats and sealed with a glossy topcoat. Hustle can be described as a fierce shimmery violet shade that is enhanced by a generous amount of gold flakes. And here we have the favorite among the sea of favorites! Isn't it stunning?! The color to glitter combination is really unique and I am loving every bit of it. It almost gives it a textured/dimensional vibe, but I assure you it's as smooth as butter. The formula has a very opaque application, but like the previous shade it's not enough to be a one coater. It has really nice even coverage with a good distribution of the glitters. It dries to a minimal gritty finish due to the glitters, but smooths out perfectly after topcoat. Shown in two coats and sealed with a glossy topcoat. Savvy can be described as a a bright pink polish with a bit of pink shimmer and shiny, multi-chromatic flakies. As you know by now, I'm not typically a fan of pink shades... but every now and then I get to swatch one that blows my mind. That's this one right here! The combination of the flakies and shimmer really make this pink pop, plus it's so bright and great for summer time. The formula has a very opaque application, but not quite enough to be a one coater. Consistency wise it's a little on the thin side, but works well with this shade since it's so full of flakies. Speaking of which, there is plenty of flakies per brush stroke that don't clump and spread well. There are minimal brush strokes in the finish that mostly blend out after topcoat. Shown in two coats and sealed with a glossy topcoat. Overall I have to say it's been a while since I have felt this level of impressed with a new to me brand. The consistent opaque formulas were just flawless and such a dream to work with. This is honestly one of those times where I just have to give it up to the maker for creating an amazingly drool-worthy collection. I mean I was practically gushing throughout this review, haha. I'm very impressed to say the least. As for which one is my pick for must-have... It's definitely a tough call. When it comes down to the wire, I have to give it to Hustle for being the most unique in the trio. But that's my pick, now tell me yours! But before you leave let's talk about the giveaway! 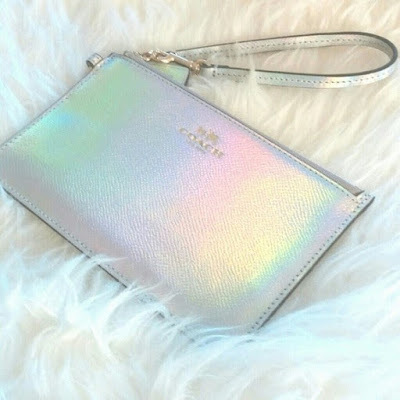 Stella Chroma will be giving away a Coach holographic wristlet to one of the first customers. Making a purchase in the first week of the shop being open counts as an entry. If a customer adds a note to their order stating that a certain person sent them to the site to make that order, the customer and the person will get another entry! So be sure to say if I sent you! To recap, The Premier Trio by Stella Chroma will be releasing Thursday, June 29th. Each full-size 15mL bottle will be retailing for $12 to $13, depending on the finish. I love this kind of nail polish because it always make nails nice looking and shiny, giving them different lovely shades.